Far-Flung Follows Function is an extravagant, hour-long theatrical exploration in which the performance space turns into a crashing computer whose population of finders, daemons, mice, and the like struggle to avert catastrophe. It is a fast-moving piece with comic overtones; a performance installation with no spoken words but instead a strong visual language of stylized action, gesture, video, written text, and light. How it begins: Somewhere on the Internet a user writes one word too much and a global error occurs. All of a sudden the network is stuffed up— communication gets slow and a traffic jam stifles all incoming and outgoing data. But then something breaks and information begins flowing through every opening. Several applications merge, while user input and software scripts create new electronic life forms. In this new reign of mangled software, user interface functions become humanoid. The system has crashed, but it is very far from dead. 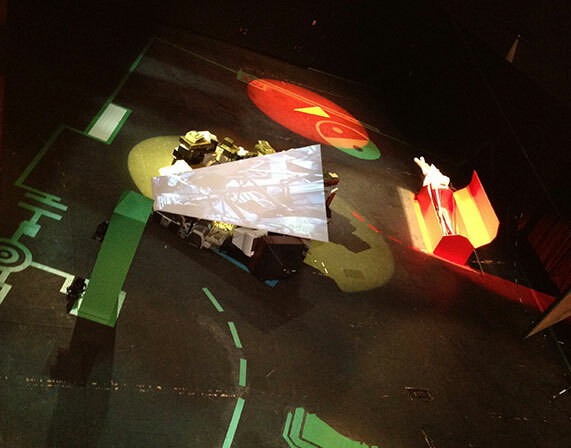 As the piece begins, audience members find themselves inside a computer, somewhere down near the central core. They are invited to witness three attempts to restart the crashed system during which they are encouraged to wander freely through the entire space, for they too are part of the system. First to awaken are the MouseCursor and MouseHelper, who begin rummaging frantically through their toolbox. Before long, the Finder is hard at work rebuilding his enormous equipment dump. Two AppDaemons help the Writer begin to catalog what went wrong in a postmodern error log, while elsewhere the Innamorati—a pair of online lovers drawn into the computer by the crash—pursue a relationship as they are flung unexpectedly from one city to another. 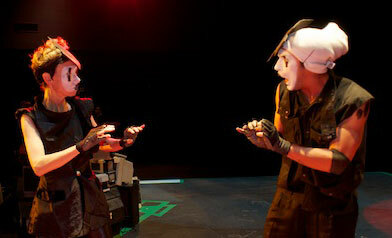 Welcome to the commedia of the motherboard! Overhead view of stage, with Finder dump at center and toolbox at right. The stage is configured like an abstract motherboard, with such apparently familiar functions as a toolbox and a USB port, as well as other less usual elements like a sewer grate. The Finder operates from a centrally located heap of obsolete electronic equipment to which no one else has access. The Writer creates her error log from a rolling skeletal cart, like a latter-day automaton. The set pieces, including two projection screens, were built by Lee Day and Samson Day. Finder and Writer in one of their several encounters. 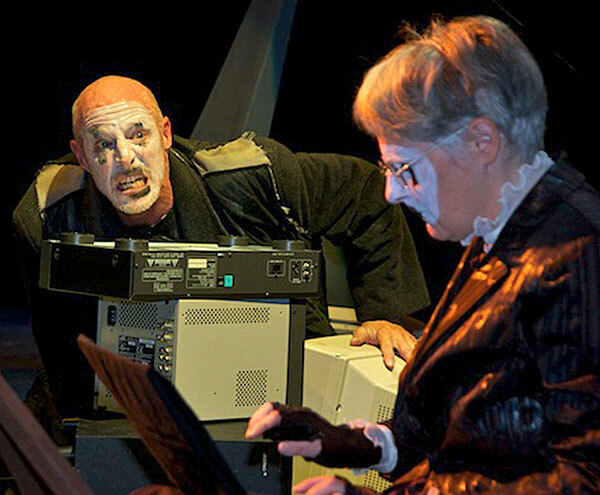 In Far-Flung, the entire theatrical environment and associated media are run by a group of linked programs written in the Max 6 language by David Clarke. These programs collectively are thought of as a virtual character in the project, LocationProperties. Some show elements are preset, but many include semi-randomized or otherwise indeterminate processes that create an ever-shifting, partly unpredictable experience for performers and audience members alike. For example, many of the lights are set to respond to live time-of-day and weather information being drawn from 30 cities around the world. At any given moment, the lighting can shift from a bright setting reflecting a sunny day in Karachi to a dark setting reflecting a rainy night in Hong Kong. The complicated plan for controlling the lights through Max in this double way (both preset and semi-randomized) was worked out by lighting designer Naomie Winch in collaboration with David Clarke. Some video elements are linked to the shifting lights, while other video elements and sounds are linked to the actions of specific characters in the piece. Two of the characters at times control a surveillance camera whose captured image is fed back into the space as part of the changing environment. Writer giving directions to HelperApps. All characters (except the virtual LocationProperties) are in whiteface makeup as a sign of their immateriality as computer functions. Black elements marking eyes and mouth are stylizations of the design of a 3-prong electrical outlet. 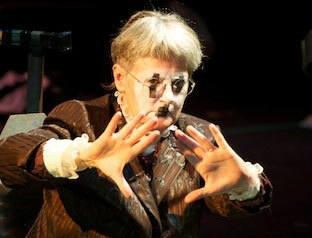 The costumes are a stylized neo-Victorian-punk mashup. Both makeup and costumes were designed by Alexis Scott. MouseCursor and MouseDaemon working things out. Far-Flung follows function had its west-coast Stage 1 premiere at the Experimental Media Performance Lab at the Contemporary Arts Center in Irvine, California, in October 2013. Special thanks to the University of California, Irvine, for supporting this production, and especially for production assistance and technical advice from Keith Bangs and crew, Jason Valdry, Ron Cargile, BC Keller, and Jaymi Smith. Thanks also to sound consultant Mark Caspary, programming consultant Juan Rubio, and spotlight operators Patty Lin, Diana Campos, and Kyle Swatzell.